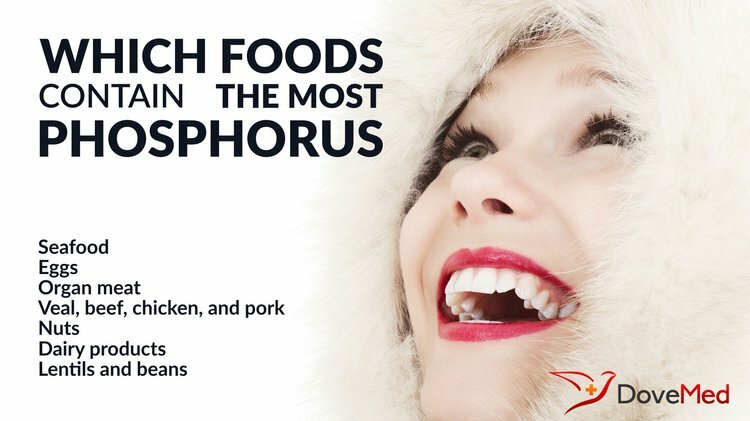 Which Foods Contain The Most Phosphorus? Phosphorus is one of the most important mineral elements of the human body. Per the University of Maryland Medical Center, almost 85% of the body’s phosphorus is found in the bones and teeth. Phosphorus is one of the most important mineral elements of the human body. Per the University of Maryland Medical Center, almost 85% of the body’s phosphorus is found in the bones and teeth. Together with calcium, phosphorus is necessary for the formation of strong bones and teeth. Bones are vital to protect our internal organs; they also provide shape and structure to our body and anchor muscles. A regular diet that is rich in proteins and consists of milk and milk products, eggs, fish, and meat, may make-up for the body’s requirement of nutritional phosphorus. The kidneys require phosphorus to work efficiently in filtering out wastes. Phosphorus is essential for many biochemical reactions and processes and for the utilization and storage of energy. Such processes include fat and carbohydrate metabolism to produce energy, synthesis of proteins by ATP (adenosine triphosphate, the ‘energy currency’ of the body), ensuring proper functioning of many enzymes, synthesizing DNA and RNA, etc. Phosphorus supports proper nerve and muscle function. It also protects the body by aiding in the growth and repair of cells and tissues. It has a role to play in the use of our body’s minerals and vitamins (like iodine and vitamin D) and helps keep them in balance at the required levels. Vitamin D is a key component that helps in the mineralisation of bones, ensuring healthy bone development. Towards this process, vitamin D maintains the blood concentration of calcium and phosphorus. This is the reason why milk is often fortified with vitamin D.
According to the US National Academy of Sciences Food and Nutrition Board, the recommended dietary allowance (RDA) of phosphorus for children and adolescents is 1250 milligrams/day and 700 milligrams/day for adults. Different age groups have different phosphorus requirement quantities. The RDA during pregnancy and for lactating mothers is 700 milligrams/day. Phosphorus deficiencies or low phosphorus diets are often associated with extreme starvation or other underlying conditions such as kidney disorders. However, this condition is not observed commonly, since dietary phosphorus is widely present. Low phosphorus levels can cause weak bones, numbness, appetite loss, and rickets in children. On the other hand, high levels of phosphorus (termed hyperphosphatemia) can occur with a higher absorption rate of foods with phosphorus. But, this condition is generally seen in individuals with severe renal conditions such as chronic kidney disease or end-stage renal disease. The proper intake and absorption of phosphorus may be affected by certain medications and disorders. It is always recommended to take the advice of a suitable healthcare professional before bringing about any alteration to your regular food habits and diet or taking any multivitamin-mineral supplements. Mason JB. Vitamins, trace minerals, and othermicronutrients. In: Goldman L, Ausiello D, eds. Cecil Medicine. 24th ed. Philadelphia, Pa: Saunders Elsevier; 2011:chap 225. Institute of Medicine. Food and Nutrition Board. Dietary Reference Intakes for Calcium, Phosphorous, Magnesium, Vitamin D, and Fluoride. National Academy Press, Washington, DC, 1997. Calvo MS. Dietary phosphorus, calcium metabolism and bone. J Nutr 1993;123:1627-33. Kalantar-Zadeh, K., Gutekunst, L., Mehrotra, R., Kovesdy, C. P., Bross, R., Shinaberger, C. S., ... & Kopple, J. D. (2010). Understanding sources of dietary phosphorus in the treatment of patients with chronic kidney disease.Clinical Journal of the American Society of Nephrology, 5(3), 519-530. Uribarri, J., & Calvo, M. S. (2003, May). Hidden sources of phosphorus in the typical American diet: does it matter in nephrology?. In Seminars in dialysis (Vol. 16, No. 3, pp. 186-188). Blackwell Science Inc.
Neset, T. S. S., Bader, H. P., Scheidegger, R., & Lohm, U. (2008). The flow of phosphorus in food production and consumption—Linköping, Sweden, 1870–2000. Science of the Total Environment, 396(2), 111-120. Childers, D. L., Corman, J., Edwards, M., & Elser, J. J. (2011). Sustainability challenges of phosphorus and food: solutions from closing the human phosphorus cycle. BioScience, 61(2), 117-124. Antikainen, R., Lemola, R., Nousiainen, J. I., Sokka, L., Esala, M., Huhtanen, P., & Rekolainen, S. (2005). Stocks and flows of nitrogen and phosphorus in the Finnish food production and consumption system.Agriculture, Ecosystems & Environment, 107(2), 287-305. Elser, J., & Bennett, E. (2011). Phosphorus cycle: a broken biogeochemical cycle. Nature, 478(7367), 29-31. Fulgoni, V. L., Keast, D. R., Bailey, R. L., & Dwyer, J. (2011). Foods, fortificants, and supplements: where do Americans get their nutrients?. The Journal of nutrition, 141(10), 1847-1854.